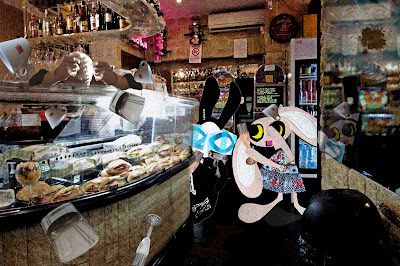 Lapinette and the Wabbit swept into the caffè but the red speckled wind got there first. Dust swirled in every cranny. The Wabbit called for drinks and got them - but he declined the sandy sandwiches. Without warning, the bartender slumped unconscious across the bar. Glasses and cups flew everywhere, but made not a single sound as they hit the floor. The Wabbit sipped his wine, pulled out his automatic and looked at Lapinette. Lapinette looked back. Their ears retracted slightly and they waited. Suddenly glasses and cups smashed noisily and there was a devastating crack as the mirror shattered. "That was a ghost bullet," said the Wabbit. Lapinette wrinkled her nose and picked some glass from her frock. "The bullet seemed real enough." The Wabbit pushed his automatic back in his fur and shrugged. "In popular folklore," he said, "a ghost bullet can only be fired by a ghost." The wind hammered the windows like a debt collector and the door creaked. Lapinette shivered. "Then we'd better find the ghost." The Wabbit had to think. "We need to know what kind of a ghost this is." Lapinette had no option but to join in. "A poltergeist?" Another glass smashed to the floor by her feet and a coffee cup flew past her head. "I don't think so," said the Wabbit, neatly dodging a whisky tumbler, "they don't come armed." The espresso machine burst into life and made coffee. "Deus ex machina?" sighed the Wabbit.